Tom Petty’s tragic death has left the entire world mourning — his music left a mark on millions of people’s hearts over the decades. Even though he passed away on October 2, 2017 — his music will live on forever. Tom Petty wasn’t just an incredible musician, he was also an amazing songwriter. He wrote and recorded the popular song ‘Stop Draggin’ My Heart Around’ with Stevie Nicks. It went on to be one of her most popular songs. Stevie Nicks and the 66-year-old legendary musician were actually longtime friends. In the video you’re about to see — they perform together for the very last time. In July of 2017, Tom Petty was performing in London’s world-famous Hyde Park — he had a big surprise in store for the crowd. 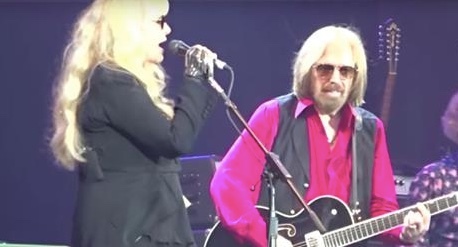 When the show was coming to an end, Petty announced that he had a special guest that was going to join him on stage. It was Stevie Nicks. Their performance is incredible and you can definitely tell that they had a musical chemistry. Tom Petty will be forever missed but we’re so grateful that we have videos like this to last for eternity. Continue to the next page to watch their incredible performance.